Written originally by Charles Dickens in 1843, "A Christmas Carol" has been adapted over the years for the stage, big screen, cartoons, and every imaginable entertainment venue possible. The truths revealed through Scrooge, Marley, and his three ghosts are timeless and touch the hearts of everyone treated to its sincerity. This version of the beloved book is interspersed with "life lessons" concise enough to share in a moment--compelling enough to be remembered for a lifetime. These meaningful contemporary maxims are ideal conversation-starters for families or small groups. Whether gathered around the fireplace, studying literature, or with your family crowded around the kitchen table, "A Christmas Carol" fosters appreciation for the arts and provides priceless opportunities to affirm and encourage the highest aspirations. 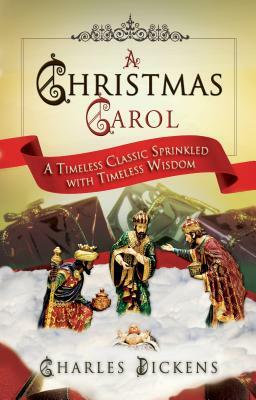 Predicted to become a prized possession, "A Christmas Carol" will be passed down through generations, revisited regularly, and remembered into old age. From "Bah Humbug " to Tiny Tim's "God bless us, every one ," you will be encouraged and inspired to live life sensitive to others, sharing your blessings, and enjoying the love of others.